At the time of writing this blog, MongoDB is the world’s leading NoSQL database server, and (per DB-Engines ranking, the most widely-known ranking in the database industry) the 5th database server overall in terms of popularity. As you may have seen before, we’ve published a ‘Become a MongoDB DBA’ blog series, which covers all the need-to-know information when getting started with MongoDB (for example, when you’re rather a MySQL DBA) and we have now taken the next logical step in our work on MongoDB by producing this new white paper: MongoDB Management and Automation with ClusterControl. This white paper extends on the Become a MongoDB DBA series by focussing further on how to manage and automate MongoDB with the help of ClusterControl, our all-inclusive management system for open source databases. What of the operational management of a production environment? How easy is it to deploy a distributed environment, and then manage it? 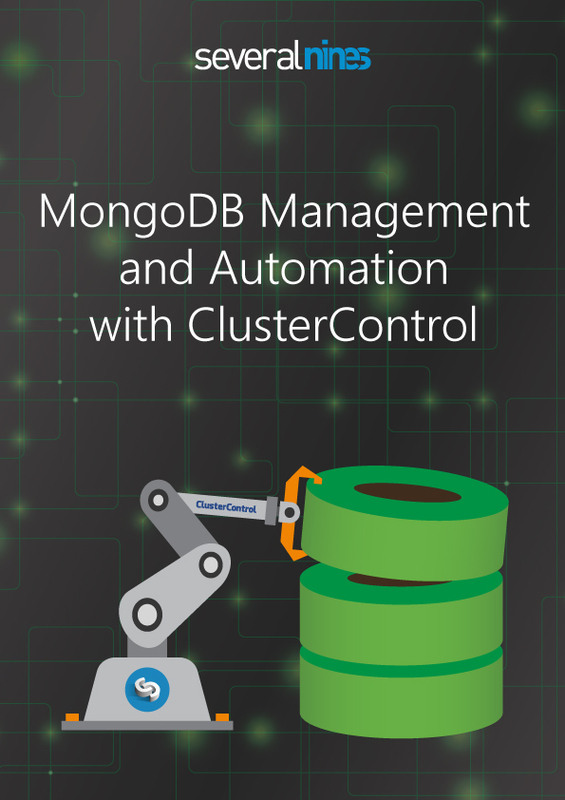 In this whitepaper, we cover some of the fundamentals of MongoDB, and show you how a clustered environment can be automated with ClusterControl. To summarise, in this white paper, we have reviewed the challenges involved in managing MongoDB at scale and have introduced mitigating features of ClusterControl. As a best of breed database management solution, ClusterControl brings consistency and reliability to your database environment, and simplifies your database operations at scale. ClusterControl is the all-inclusive open source database management system for users with mixed environments that removes the need for multiple management tools. It provides advanced deployment, management, monitoring, and scaling functionality to get your MySQL, MongoDB, and PostgreSQL databases up- and- running using proven methodologies that you can depend on to work. At the core of ClusterControl is its automation functionality that lets you automate many of the database tasks you have to perform regularly like deploying new databases, adding and scaling new nodes, running backups and upgrades, and more.